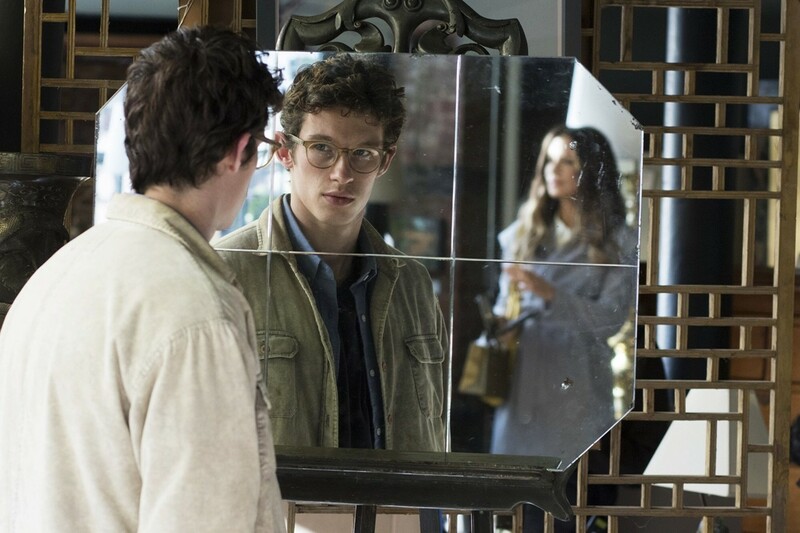 After the perfectly enjoyable melodrama "Gifted" earlier this year, director Marc Webb returns with "The Only Living Boy in New York," a coming-of-age narrative that cobbles together its story from a collection of familiar elements and tropes, then renders them completely ineffective in the process. Following the lives of well-to-do Manhattan writers, artists, and various cultural elite, "Only Living Boy" is filled to the brim with self-consciously deployed literary references. But the script by Allan Loeb ("Collateral Beauty") has an inability to understand how smart people talk to one another; even a fantastically talented cast can't make the words convincing. Thomas Webb (Callum Turner, "Green Room") is a 20-something recent graduate entering the malaise of post-college life. An aspiring writer, he's self-conscious about leading what he believes has thus far been a boring, conventional life. He's afraid that he won't have enough material to draw upon once he starts creating stories. Thomas has also been chasing after his friend Mimi (Kiersey Clemons, "Dope") ever since they spent a night together. But she's decided they're better as friends, and Thomas has trouble accepting that. Enter Thomas's mysterious new upstairs neighbor, W.F. (Jeff Bridges), who immediately begins dispensing life wisdom and offering to help Thomas convince Mimi to sleep with him again. Aside from coming across as a complete creep, W.F. becomes Thomas's mentor and confidante, taking a vested interest in the boy for reasons that only gradually become clear. He's also an alcoholic, but in that charming way that only writers in movies are able to be. Bridges also delivers cloying voiceover throughout the story, cluing us into the inner feelings of each character we meet. Eventually Thomas learns that his publisher father (Pierce Brosnan) is cheating on his fragile, bipolar mother (Cynthia Nixon) with one of his employees, Johanna (Kate Beckinsale). Thomas initially sets out to confront Johanna, but can't bring himself to say anything to her and settles for following her around the city. Eventually they do speak and as the accusations begin to fly, she starts by out calling him a child who doesn't understand how the world works -- then she ends up sleeping with him ... because he's just so naturally irresistible, you see. As the two enter into their own affair, Thomas seems to be acting out of his own tension with his father, who we learn became a publisher when he couldn't cut it as a writer himself. "The Only Living Boy in New York" clearly wants to be "The Graduate," and not just because of the Simon and Garfunkel soundtrack. It also occasionally desires to be a Woody Allen film, but lacks any of the wit Allen brings to even his worst films. The biggest problem here is that the film wants the audience to see Thomas as a good guy at heart, then doesn't bother to present us with any evidence whatsoever to back that up. Everyone around Thomas can't stop telling him how funny and clever his observations are; that he's such a kind, genuine person, and just how goddamn wonderful he is. But we don't see any of that. It's possible to tell stories about privileged white people in compelling ways, but Loeb is clearly unfamiliar with what any those ways might be. None of the female characters have any sort of interior lives of their own, and they seem to exist to guide the men around them into having revelations about their lives. Kiersey Clemons was a vibrant presence in "Dope" and she continues to be, even when playing a character the script can't be bothered to try and understand. "Love and Friendship" recently reminded us how wonderful Beckinsale can be, but here she's saddled with a character whose actions don't make a lick of sense. There are any number of characters in the story who might make an interesting center to a movie, but the creators don't have enough imagination to put anything other than a bland, rich, white guy at the center of the world. Because this is an Allan Loeb script, there have to be some late in the game twists to provide the sense that there's a Deep Meaning in the randomness of life. It didn't work when Loeb tried it in "Collateral Beauty" and it doesn't work here. At least "Collateral Beauty" had the batshit insane factor working for it. "The Only Living Boy on New York" ends up as bland and boring as its protagonist.